Blessed Robert, one of the principal historical figures of his time and one of the most astonishing Saints of the Church, was born at Arbrissel, now Arbressec, a short distance from Rennes, in about 1045. He studied in Paris, sustained in his poverty by the assistance of charitable benefactors, and became there a celebrated doctor in the sacred sciences. His remarkable gifts were everywhere appreciated. It is supposed that he was ordained a priest in Paris, before the bishop of his native diocese of Rennes recalled him in 1085 to assist him in reforming his flock. There in Brittany, as archpriest, Robert devoted himself to the healing of feuds, the suppression of simony, lay investiture, clerical concubinage and irregular marriages. He was compelled, by the hostility his reforming zeal had caused, to leave the diocese when his bishop died in 1093. After teaching theology for a time in Angers, in 1095 he became a hermit near Laval with several others, two of whom later founded monasteries, as he himself did in 1096, at the site where they were then dwelling in the forest of Craon near Roe. The reputation of the solitaries had attracted many to visit them, and the piety, kindness, eloquence and strong personality of Robert in particular drew many followers; it is said that the forest of Craon became the dwelling-place of a multitude of anchorites, as once the deserts of Egypt were. 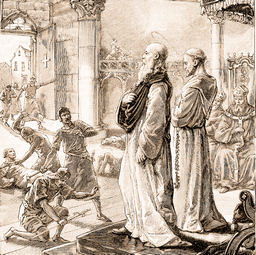 Blessed Robert was summoned by Pope Urban II to go to Angers to preach for the dedication of a church; the Pope sent him out from there as apostolic missionary, on a preaching tour of the various provinces. He left his abbacy in the region of Roe and taught abandonment of the world and evangelical poverty all over western France. His gifts of grace and nature attracted crowds and effected countless conversions. His disciples were of all ages and conditions, including lepers; even whole families followed him everywhere. Thus was founded his famous monastery of Fontevrault, not far from Cannes, to lodge these flocks of determined followers of the Gospel. The men dwelt in a separate region from the women; each group had its chapel, and the lepers their quarters apart. Charity, silence, modesty and meekness characterized these establishments, which were sustained by the products of the earth and the alms offered by the neighboring populations. Until the death of the holy patriarch in 1117, he continued to preach everywhere in western France. The enemy of souls could not remain indifferent to all of this Christian sanctity. Persecuted by certain heretics and others during his life, Blessed Robert was accused of exaggeration and calumniated after his death, but the accusatory writings were eventually declared to be forgeries. A calumniatory letter, attributed falsely to an abbot of western France, who had in other situations shown a vindictive spirit, was definitely proved not to be from his hand, but written by the heretic Roscelin and containing pure fabrications. Blessed Robert is remembered for his ideal of perfect poverty, both exterior and interior, according to the words of Our Lord, His first beatitude: Blessed are the poor in spirit. He was buried at Fontevrault, as he had desired to be, but his remains were later transferred to a house of the Order, restored in 1806 after the revolution, at Chemillé in the diocese of Angers. The first biography of Blessed Robert was written by Baudri, Archbishop of Dol in Brittany, his intimate friend, at the request of Venerable Petronilla of Chemillé, widow, and first Abbess of this immense and celebrated monastery, who was named by Blessed Robert to replace him at his death as Superior General of the Order of Fontevrault. The feast of Venerable Petronilla (1149) was celebrated by the Order of Fontevrault on April 24th. The Bollandists remark: Her existence was marked by many contradictions, but she had the courage to pass beyond the judgment of human beings and to walk without deviating on the path to heaven. 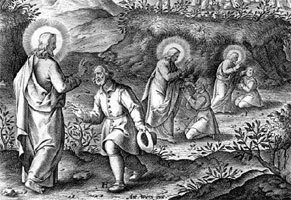 “As Jesus came down from the mountain with Peter, James, John and approached the other disciples, they saw a large crowd around them and scribes arguing with them. Immediately on seeing him, the whole crowd was utterly amazed. Wherever it seizes him, it throws him down; he foams at the mouth, grinds his teeth, and becomes rigid. He said to them in reply, “O faithless generation, how long will I be with you? And when he saw him, the spirit immediately threw the boy into convulsions. As he fell to the ground, he began to roll around and foam at the mouth. He said to them, “This kind can only come out through prayer.” -Mark 9:14-29.